Luxurious, open interior, fireplace, fully equipped gourmet kitchen, DVD nook, CD player, and wifi computer access will give you so much to do indoors, who needs to go out? But when you do there is so much more. Deer roam freely. You can watch the sky from the front porch or grill in back while you enjoy the private deck. Saw Creek is a private, gated community with a pond for swimming or canoeing, five outdoor swimming pools and an indoor swimming pool, indoor and outdoor tennis courts, a children's playground, and in the winter, a ski slope. There is a workout room, restaurant, and bar also in the complex with a great deck where you can watch the sunset as you sip the drink of your choice. Outside the gates there is hiking in the Delaware Water Gap National Recreation area, canoeing and rafting down the river, swimming in the river as well. The Fernwood Resort is nearby which has several restaurants and bumper boats for summer fun. Full bath has a private entrance to the Master Bedroom as well as an entrance from the hall. This house is best suited to a honeymoon/anniversary couple, four adults, or families with children. The house is not childproofed. Very nice home in a quiet gated community. My wife and I along with our 3 year old boxer/lab really enjoyed our week in your house. Great location and lots of hiking, waterfalls and dog friendly trails in the area. We plan on coming back next fall for longer. Relaxing, quiet location. Owner very responsive. Thanks again! We had a nice weekend in the Poconos! Sheila's detailed instructions made getting to the house and into Saw Creek easy. The home was clean and comfortable. When we came in, it almost immediately felt like home. 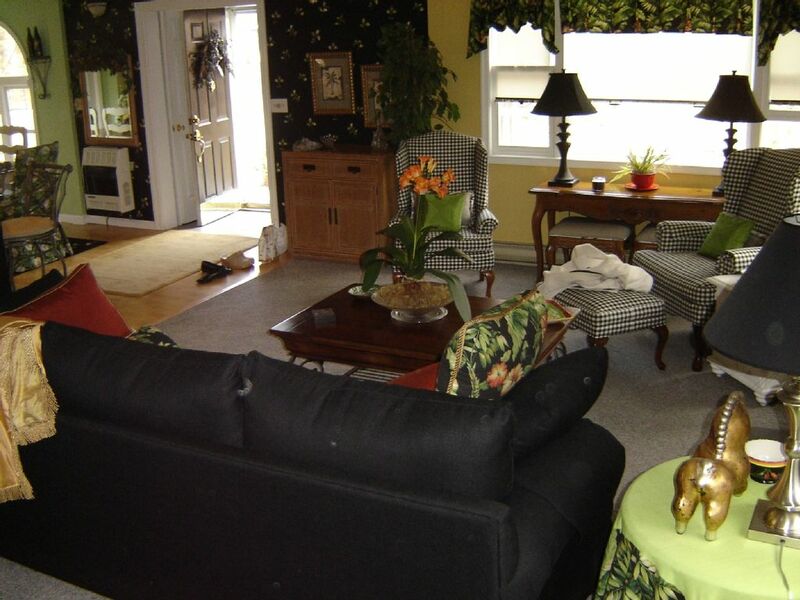 The house was very well maintained and comfortable. We would definitely recommend it! Thanks to the owner for hosting us in their wonderful home. Woods, rivers, ponds, waterfalls, nature hikes, swimming, boating, tennis, mountains, mountain biking, nearby are golf courses, outlet shopping, fine and casual dining, an artist enclave in Milford, live theater at the Shawnee Playhouse, Shawnee Mountain, Water Gap National Recreation Area, Bushkill Falls, the Appalachian Trail, Stroudsburg, PA. Reservation will be held for 24 hours to allow deposit to be made. If deposit is not made within that time, the dates will be released.